Panoramic ocean views, soft dunes, and beach grass create an idyllic setting for this bold and contextualized Bridgehampton home, where flood plane and coastal erosion requirements, along with a narrow lot with restrictive setbacks, created exciting challenges for a project in which the client was looking to maximize both square footage and dynamic architectural form. On the carefully sculpted facade, expressive layering of frameless glass and Ipe rainscreen cladding wrap the building, while deep sunshades project from the structure. The black metal of the rear balconies similarly protrude from the building, exposing a thin edge of blackened steel plate wrapping horizontally and vertically around the floating forms. The footprint, while also responding to the site’s contours, is shaped primarily to maximize the generous views to the Atlantic Ocean. 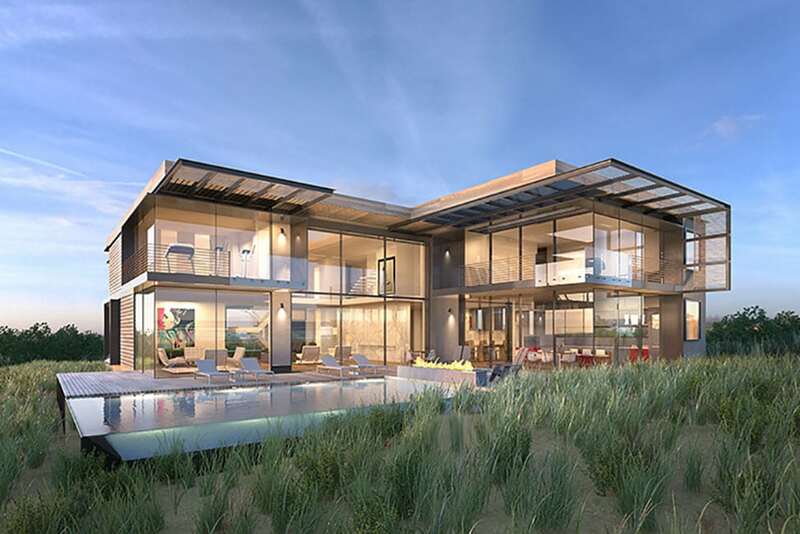 Public and private functions of the home are separated with the use of full height sliding glass panels, while the same panels create the opportunity for opening the floor plan into a fully connected space. Upon entering from behind an etched glass screen wall, visitors are immediately greeted with a double-height wall of frameless glass panels and unobstructed views of the ocean. A custom wood and metal staircase floats in the entry foyer, spaced from the front wall by an interior planter, and on full display to the exterior through a two-story high metal clad front window. The core functions of the first floor are all programmed along the tall rear glass wall, with a simple yet dynamic white stone panel wall acting as a minimal separation between spaces. The living room, media room, lounge, and dining room all enjoy the generous natural daylight from this opening, while the kitchen is carefully placed in the rear corner with maximum connectivity to the rear deck and infinity pool. With the sliding glass wall system open, these public spaces are all effortlessly extended to the pool area for a truly seamless outdoor living experience.